SG Premier Season 5 is now open for registration. There is a slight change in game format and structure for this new season. Look out for a series of programs - from player selection‚ to open tournaments‚ to exclusive Elite Player League solely for SG Premier players and many more. More details will be released in January! 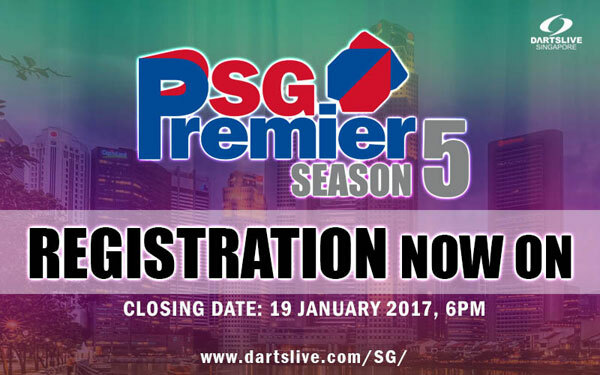 Registration for SG Premier Season 5 closes the same day as SUPER LEAGUE Season 13 - 19 January 2017. Captains please have the form duly filled up with Shop Stamp as acknowledgement and submit to DARTSLIVE Singapore via email league_sg@dartslive.com or fax 6735 1381 before closing date.